Having foodie friends is a great way to get inspiration. They tell you about fabulous things they have made or tried. That is how today’s recipe came about. My friend, David (a co-worker and fellow foodie), raved about a dish he tried at a local winery-salad of salt roasted beets with baby arugula, goat cheese, red onion, and truffle vinaigrette. Pause for a collective yummmm! I didn’t eat the dish so obviously I can’t recreate it. But I can be inspired! Spread a thin layer of salt on the bottom of small oven safe glass dish or roasting pan the pan. Preheat the oven to 425 degrees. Place the beets in the pan on top of the salt. Cover well with foil; bake about an hour, or until tender. Remove from oven and allow to cool enough to handle. Combine the greens, pecans, onion, and blue cheese. When cool, gently peel the beets with the edge of a knife, being careful not to gouge out any of the meat. (Do this wearing something you aren’t in love with. These things are very magenta!) Slice the beets thinly and quarter into bite sized pieces and place on top of the salad. Apply Lemon Vinaigrette as desired. Serves 3. Combine the above ingredients well. Refrigerate any leftovers. I’m not a huge fan of beets, but I bet I would like them this way. Pecan and blue cheese go so well together. This salad looks great! I’m trying to eat more beets, so this is a tasty way to have them–thanks! Beets are SO healthy and I love them in salads! Looks delicious and fresh! Love the combo of flavors and colors here. A boring salad? No way! 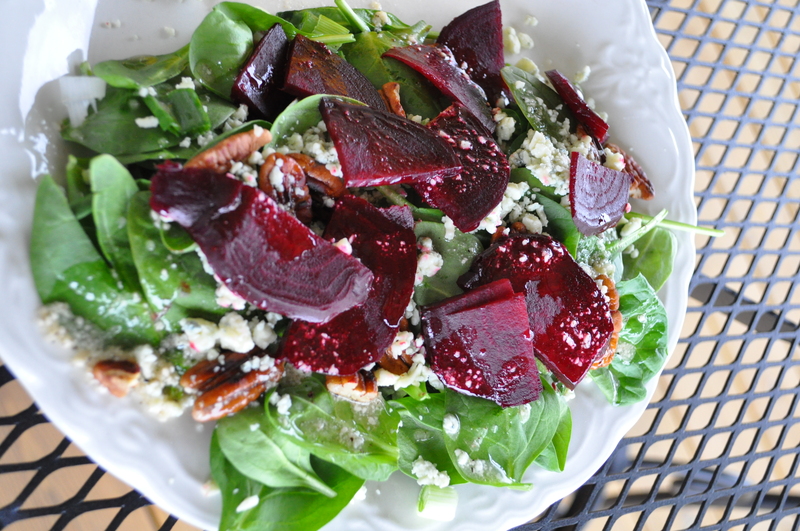 Beets and blue cheese are a great combination! I had heard of beets roasted in salt, but not on salt yet. Do you know the benefit of roasting on salt (as compared to in salt or without salt)? I usually roast them without salt, covered in foil individually. Well if it’s covered in salt, this will make the taste stronger as in more salty, and it looks nice to crack open the salt crust at the table (you’d probably need to spray a bit of water to get an actual crust). I had not thought about the cleaning part, but for that foil is indeed just as good. I don’t use enough salt to cover it completely. Maybe I should? I think it’d be worth trying! I will. And I’ll let you know if there is any difference.